In the summer heat, there is something appealing about these playful, very un-Claire-like colours. I could never live with them (at least not the purple) but I like the sense of fun in this room. 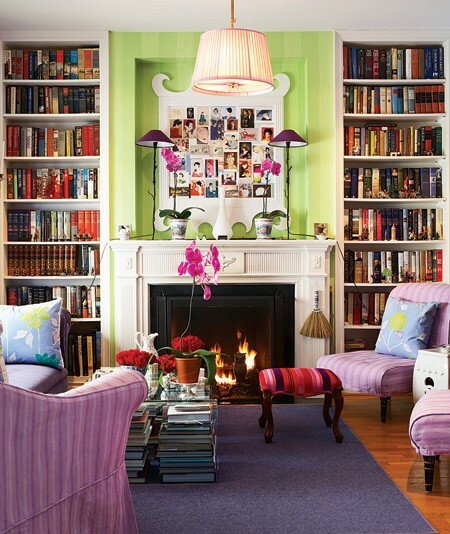 I absolutely love this room, Claire, from the lime green walls to the purple rug! No, they are not colours I might’ve chosen – I’d not have the courage to use such a bright colour as lime green but it is all so pretty and so very cleverly done. I even notice lime-coloured flowers on the cushions, to ‘tie’ them to the wall colour. I also love the arrangements of postcards attached to that white curly frame. There is just one detail which I’d change (there’s always one!) and that is the pendant lampshade. This style of shade looks like it’s been removed from a table lamp, and I don’t think it looks right dangling from the ceiling. I don’t normally like wood floors, either, smart as they are for I find cold-looking, but here the polished wood looks warm and inviting, and feet will be allowed to rest on that glorious purple rug. Love the stool in front of the fire, too. Yes, my kind of room! Just a thought … I wonder whether the owners of these rooms that you show each week ever see them on your blog and read the comments? Well, I for one would never get out of the house for flipping though those stacks of coffeetable books! You’re right, Claire, the room does have a sense of fun about it. I love the room and the colors, but those chairs don’t look awfully comfortable. If I were going to have a library I’d want chairs you could lie down in. it’s very bright and cheerful, albeit not quite my style. I do really like the coffee table supported by stacks of books, but hate to think what a trouble it would be, if you actually wanted to read one of them! Ilike this one; the colors are fun, as are the choices of furniture. Looks like what I know as a Chinese garden stool is being used for a coffee/end table. Whimsy comes to mind. The room seems whimsical. I just wish that whomever photographed it had moved those gorgeous orchids. Thanks, as always. 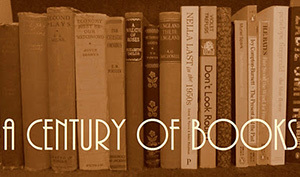 I look forward to Saturday mornings and peaking into others’ libraries, lustfully. That certainly is colourful and it kinda lifts my spirits just looking at the picture – imagine reading in there… But I have to agree with you, on the long run this may be a teensy bit too much and too bright. No colours is no fun, but too many might give this reader a head-ache. On first glance my reaction was yuck, but the more I look at it the more I like it.